Drivers honked, rolled their windows down and yelled to the more than 100 people lining the Higgins Avenue Bridge in support of the Standing Rock Sioux tribe in North Dakota. One woman on the sidewalk put down her sign to film her young daughter with her phone. “I want to have water!” the girl yelled, quickly followed with “my ears hurt,” after a car drove by honking wildly. At 4:21 p.m. Tuesday around 65 people lined the west side of the bridge, with signs, while one man beat a drum. At 4:43 that number had doubled, with supporters lining both sides of the bridge to raise awareness about the threat they feel Dakota Access Pipeline represents. “Anyone who pays any attention to the science knows we have to make a change,” said John Woodland, with 350 Missoula. Continuing to invest in fossil fuels, which the pipeline supports, isn’t sustainable, he said. Woodland said this protest was just one of many across the country Tuesday organized by 350, a nonprofit that organizes protests and movements against climate change. 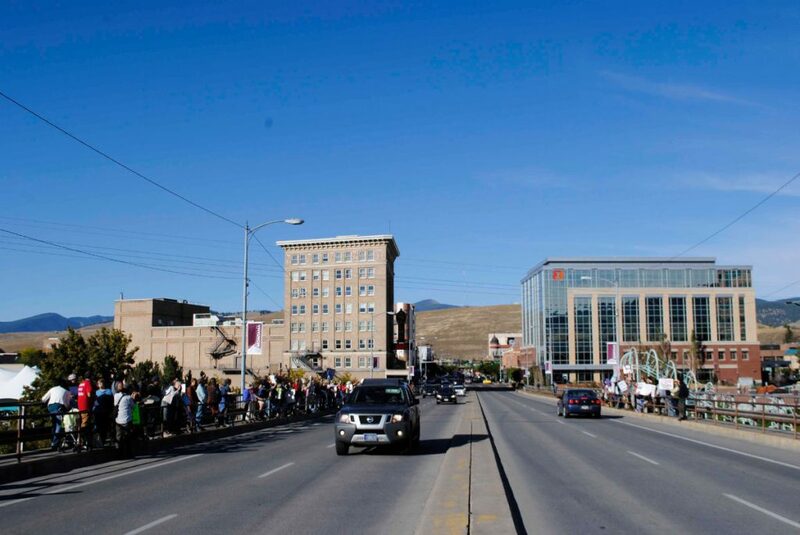 Missoula’s event was part of a planned “day of action,” by 350. According to its website, hundreds of events were planned across the United States, Europe, Asia and New Zealand. In Washington, D.C., hundreds of people gathered across from the White House to listen to speakers on the issue, including former presidential candidate Sen. Bernie Sanders of Vermont. 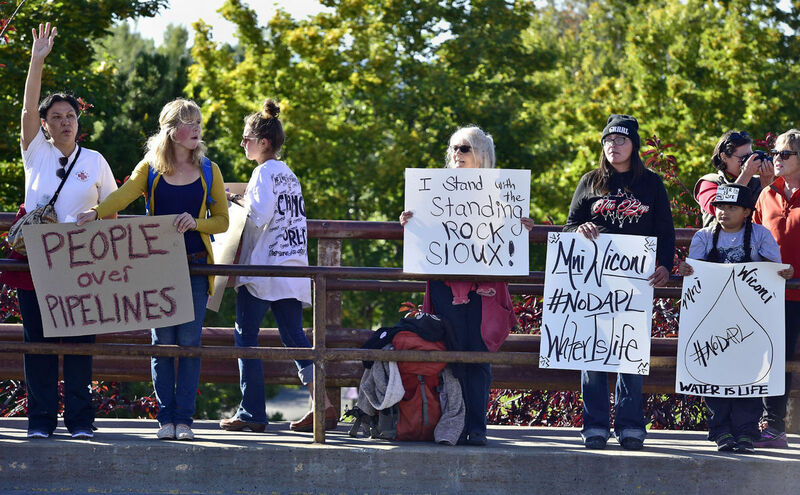 In Missoula, slogans on the bridge varied from the simple – “People over pipelines” and quite a few “Solidarity with Standing Rock” – to the largest banner, “Sow the seeds of change.” Two Northern Cheyenne flags and one Blackfeet tribal flag were held over the railing. Courtney Little Axe held one of the Northern Cheyenne Flags. She’s Cheyenne and Shawnee and is going to school at the University of Montana. “We (Native Americans) considered ourselves the water and earth protectors, since ‘protestors’ kind of has a negative connotation to it,” Little Axe said. Little Axe heard about the event from an email from 350 Missoula that she then passed on to her friends. She was excited to be part of the worldwide show of support. “I’m so happy it turned out like this,” Little Axe, with traditional beaded earrings and fur braid wraps. Missoula Police Sgt. J.C. Denton walked the line in plainclothes, asking everyone to stay out of the road and let people walk down the sidewalk. The protest in Missoula was peaceful, with Woodland discouraging a small group from trying to block traffic on the bridge. In North Dakota however, 22 people were arrested Tuesday for interfering with construction on the pipeline about 70 miles northwest of the main protest site. Morton County, North Dakota, Sheriff’s Office spokeswoman Donnell Preskey said construction workers were “swarmed” by protesters and that two people had “attached” themselves to equipment. Preskey said 20 people face charges of criminal trespassing. The two who tethered themselves to equipment also face charges of hindering law enforcement and disorderly conduct. North Dakota Gov. Jack Dalrymple has asked for federal help in coping with the long-running protest of an oil pipeline that has drawn thousands to land near the Standing Rock Sioux Reservation. This specific section of the pipeline targeted Tuesday was not part of the temporary work stoppage issued by a federal judge or the section that the federal government asked Energy Transfer Partners (EPT) to voluntarily stop work on. ETP has said construction is continuing elsewhere. In Missoula, Ray Kingfisher said he came to Higgins Avenue Bridge to stand with every Native American tribe and against environmental destruction. “Water is a human issue. If we don’t have water, we don’t have life,” he said.